I am thrilled to be able to introduce the Guide Lines Paper Collection to you today! (Be sure to click the photo to enlarge and take in all the details!) The rich purple hues are reminiscent of Spain and the hand-painted tiles found there. And of course the designs themselves are taken right from the coordinating Guide Lines background set! As an extra special touch this month we decided to print this particular collection on rich cream paper, similar in color to the Vintage Cream cardstock that we now carry. 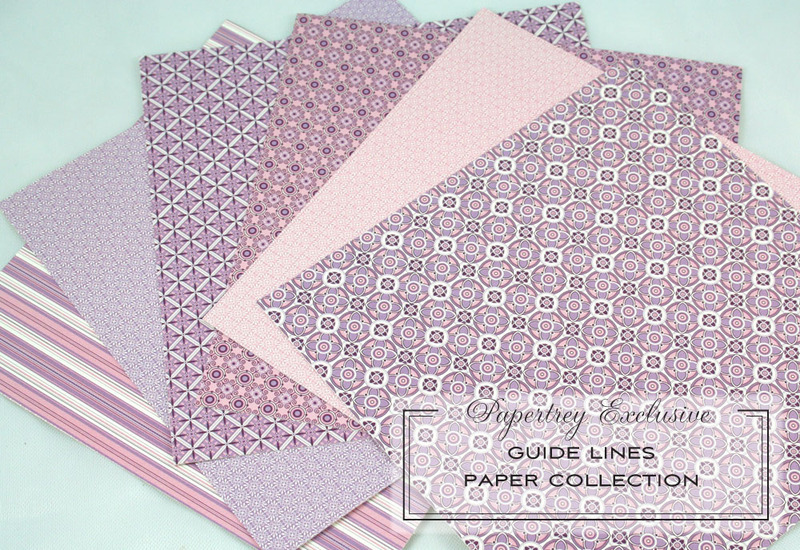 The end result is a luxurious, rich paper that will rapidly become one of your favorites! With color pulled from both Plum Pudding & Lavender Moon, you will find dozen of design possibilities. Here is a quick little card I put together using both the Guide Lines Paper Collection & Candice’s all-new Birds of a Feather set. I combined two of my favorite patterns from the collection to create my background. A little stitching detail was added as well. The center strip is made from Lavender Moon cardstock, featuring a scored accent line at the top and bottom that I did with my Scor-Pal. I trimmed a piece of the striped paper to fit in between the two score lines. I finished the strip by adding a little stitching too. I just love the three of these particular patterns together! Such a great combination! I utilized the 6×6 card makers scale for this particular project. Don’t forget that it is also available in 12×12, which features the same pattern only twice as large in scale! That really increases your options! I really adore the little chick in this stamp set! Such a cutie! And the sentiment is perfect for so many occasions! To create this little accent detail, I formed a loop with my stitched ribbon and fastened it in place with a plum brad & polka dot flower. Notice that I allowed the loop to extend over the edge of the card to help break up the "square-ness" of it. The opposite end of the ribbon that runs under the chick accent is trimmed in a "v" for a special touch. I love how quickly this card came together. Just by mixing & matching the different birds & sentiments with the same layout I could have dozens of cards made in no time for my stash! 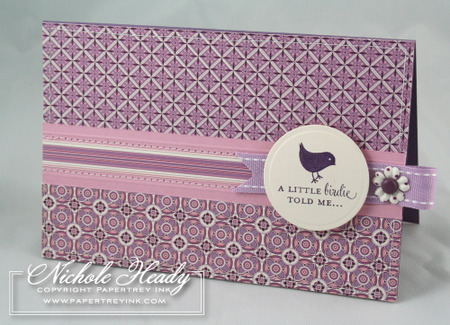 I hope you enjoyed this little peek at the new patterned paper for June. I’ll be back a little later today with a few more projects using some of the other sets waiting to be released tonight! Thanks for stopping by! Be sure to check out Debbie’s latest creation using one of the new releases! And Lisa has been busy too, putting together several more amazing peeks for you! Ink: Elegant Eggplant from SU! Wow, Nichole. The pattern papers just keep getting better and better. I love these colors and the patterns you created! Love your card, too! Wow Nichole! This is beyond stunning. The colors are fantastic. The color of the ink is just so rich too! An adorable card with such class!!! TFS. This month’s patterns are fantastic! Last month was the first time I ordered both sizes of paper and found that creates all kinds of new possibilities! I’m so excited about all the new guide lines products. 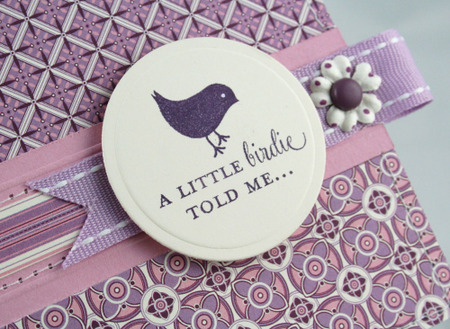 Love your card and the bird stamps too! The first word I thought of when I saw the paper was – STUNNING! The paper is definitely going in my soon to be overflowing shopping cart this release! 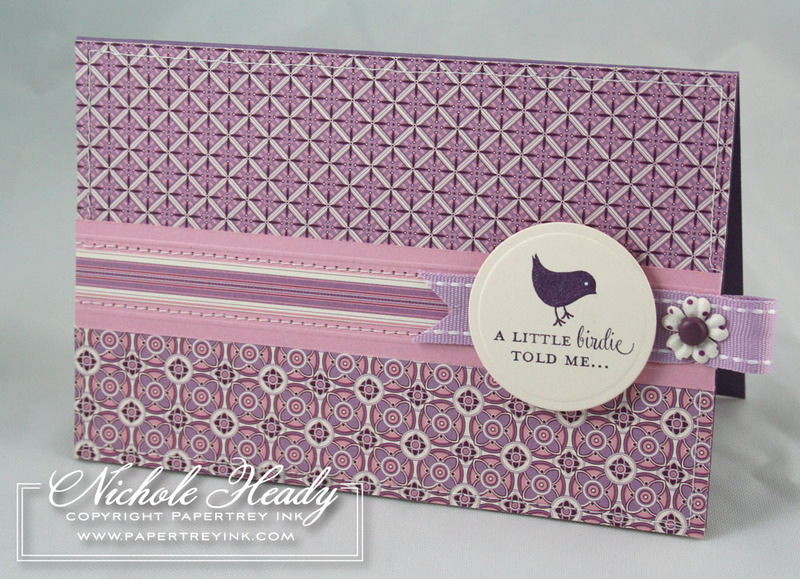 The patterned paper this month is AMAZING………..so rich and versatile! For not being a purple girl, I am starting to grow a large collection of purple supplies and goodies. This month’s paper might be my new fav! LOVE your card too! I LOVE the paper – cannot wait to add it to me collection!!!! This paper is beautiful, I love the rich color and the patterns. Very nice job with this pack, can’t wait to see all of the goodies. For someone like myself who never thought she was a purple girl, you have changed my mind! The patterns and the colours are beautiful!! You are beyond talented, and thank you for sharing such talent! Wow, wow, wow! The paper is gorgeous! Love the different patterns together! A stunning card! The mixture of sentiment fonts in this set are terrific! it just keeps getting better and better. I am IN LOVE!!!! These patterns and the colors are so wonderful. thank you thank you thank you! Wow!! This has to be my favorite release month since the perfect match release began! Thanks for giving us such wonderful tools to enrich our craft! I am in BIG trouble!!!! WOW!! OMG!!! I can’t stand it. AHHHHHH! I just have to have it, it is sooooo pretty!!! How will I ever be able to go on! ok, you have just made me a fan of purple paper! Love your designs. Hope we’ll be seeing these designs in more colors? Soooo pretty! I can’t wait to try it myself! And thanks for all the great tips that you share! Love the patterns on this paper! Purple has never been one of my go-to colors, so it means a lot when I tell you that as I scrolled down to this entry, the patterns and colors simply took my breath away. I am so impressed with your beautiful choices! Your creativity is a blessing. I think the Lavender Moon and Plum Pudding are my favorites — they are so, so pretty! And Guidelines — WOW! You are amazing! Loved the snowball paint can.